Cross stitch is fun and simple, and a nice way to get into sewing or crafting. A small cross stitch sampler makes a great gift, piece of wall art, or greeting card. This tutorial will show you the basic stuff you need and techniques you need to know to get stitching! Cut off a piece of thread. It's always tempting to start with a really long piece so that you don't have to change thread too often, but try not to get too carried away. Long threads tend to get tangled easily, and that's more of a headache than it's worth. 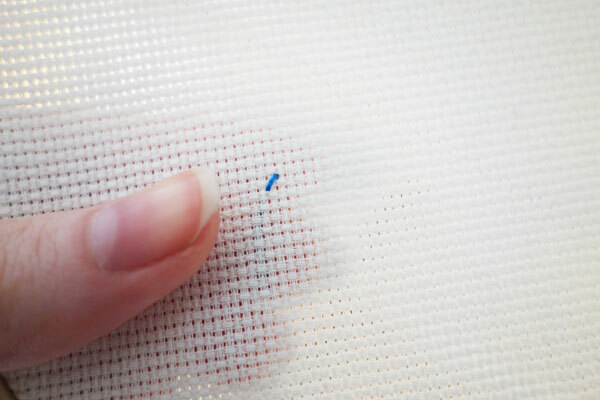 Most embroidery threads are 6 strand, but you usually only cross stitch with two strands at a time. Peel two off to begin. Thread your two strands through your embroidery needle. Embroidery needles are blunter and more rounded on the end so that they don't catch too much on the woven Aida cloth. Span your cloth across the inside round of your embroidery hoop and tighten the outer frame around it. This keeps your fabric nice and taught as you work. Cross stitch designs are made up of small "x" stitches (no kidding) that are formed by two diagonals. It's very important for continuity that all your crosses are formed exactly the same way, otherwise the finished design can look uneven. I like to stitch from bottom left to top right, and then bottom right to top left. It's up to you really, but just make sure you keep it consistent. When cross stitching, we work from the back of the fabric, towards the front. Pull your thread through the starting point, and leave a small tail. No need to knot, just keep the tail there and the tension of the consecutive stitches will make sure nothing unravels. Stitch in through the hole diagonally opposite where you came out. For the second stitch, come out through the bottom hole next to the first one. Stitch diagonally up, towards the left. For the most part, you will be cross stitching entire areas of dense stitches. For this, it's really useful to stitch diagonally for an entire section, before stitching back over the other way afterward. Note that the cross stitches share holes, so that there is not white space visible between the crosses. Sometimes you will run out of thread, or need to change colours. Just thread your excess thread through the back of your stitches to secure, and snip it off. Then start again with more thread. Easy as that! Make sure your hands are clean! Wash your mits before you start cross stitching and try to avoid working in the kitchen or around food. The cloth and thread easily pick up grime, and it's nice to have a crisp, clean finished product. If you're looking for ideas and inspiration, have a look at the directory of cool cross stitch sites I compiled over here. Most of them have free patterns and design ideas.